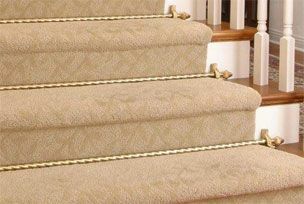 Carpet stair rods in brass, antique brass, pewter and more finishes. Hollow and solid rod lengths starting at 28.5 inches. All hardware included such as decorative finials and brackets. Find Zoroufy stair rods at affordable prices at InstallerStore.com. ***Please Note: Stair rods are for decorative use only and should not be used as a means to hold the carpet runner in place.